Q1’s expansive, crystalline structure melds spaces seamlessly over 80 perpetually iridescent levels of luxury, while the sleek and contemporary design of this lavish architectural creation provides state-of-the-art, styled opulence in this lively Queensland region. And at its peak  Australia’s only beachside observation deck where guests can experience the rare and spectacular 360° vistas of rainforest, surf and a shimmering sunset. When you’re ready to come back down to earth, Q1 Resort & Spa offers two lagoon swimming pools, an indoor heated lap pool and Q1 Spa for timeless aquatic calm. Between working on your tan and taking a dip to cool off, you can enjoy modern, fresh cuisine in the alfresco Poolside Beach Club for breakfast or lunch. And when the mood strikes to hit the town, an abundance of great restaurants and bars boasting fine Australian cuisine awaits in the vibrant Surfers Paradise dining precinct, along with cosmopolitan cafés to suit the tastes of budding baristas. Set amidst one hectare of lush landscaped grounds Q1 Resort & Spa features lagoon swimming pools, sandy beach and alfresco poolside dining at Q1 Beach Club. The resort also includes a retail precinct, restaurants and cafes, conferencing facilities, indoor heated lap pool, steam and fitness room, the tranquil Q1 Spa, private theatrette and a children's games room. 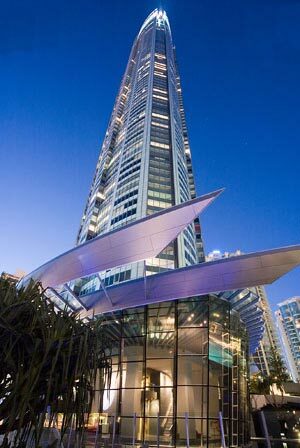 Set in the heart of Surfers Paradise, Q1 is the perfect choice for an unforgettable affair. This world-class recreational, dining and retail complex also caters for an unforgettable affair for conferences and events. Our Level 2 Ballroom will provide an elegant and sophisticated backdrop to your private function, with banquets catering for 230 patrons and cocktails for up to 400. If you require more intimate or corporate surroundings, the Q1 Boardroom is available for smaller meetings and groups, and our Business Centre allows the modern professional to stay on top of the game with private access to internet, phone and fax. What’s more, our 24-hour reception will tend to any needs to ensure that our standards meet your expectations. Located within the resort grounds and overlooking the stunning lagoon pool, the contemporary Q1 Beach Club offers casual alfresco dining. Experience the tantalising breakfast selections and Modern Australian cuisine from the all day dining menu. Featuring an impressive beverage selection from freshly squeezed juices to an extensive Australian and international wine list. Absynthe  on the piazza level of the Q1 Resort & Spa complex  is owned and operated by French-born chef Meyjitte Boughenout. Meyjitte earned two Michelin Stars as executive chef at a prestigious Belgian restaurant and is now rated as one of Australia’s leading chefs. The menu features modern French food with an Australian accent with a wine list featuring more than 1000 internationally recognised labels.